When I worked as an event planner for GE, I would have been mortified to inadvertently overlook a detail which could have shut down my event. With so many rules to follow from municipal, state, and federal bodies, it’s difficult to stay on top of everything. As a benefit auctioneer Florida … and in Virginia … and in Kentucky … and in New Hampshire .. and in some other states, I’ve learned that licensing varies greatly from location to location. Nonetheless, here are three more common licensing mistakes I see as it relates to benefit auctions. 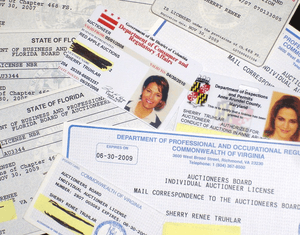 Many states have regulations around licensing raffles, sweepstakes, and contests. My Washington, D.C. clients have debates as to whether they want to involve themselves in the raffle license laws. When an organization secures a raffle license, it must follow rules affecting advertising, the number of tickets sold, and even the time of the draw (an official typically visits the site to witness the draw). In contrast, a sweepstakes – like a raffle – allows for a drawing and prizes to be awarded, but there is no requirement that a guest pay for the ticket. I know of one organization which conducts a sweepstakes to avoid the hassle of raffle rules. They ask guests to enter the sweepstakes, but since they can’t sell the tickets, they encourage donations. Most guests make at least a $5 donation, but a donation isn’t required to win a prize. Are you paying a company to manage the alcohol? Or was the wine donated and your volunteers are serving it? Are underage students handing out glasses of champagne? Is there a difference between serving hard alcohol versus wine and beer? There are so many variations in this area. Call your local authorities and check on alcohol license rules as it relates to fundraising auctions. The answer: Yes, no and sometimes. I work frequently in Virginia and Florida, where a license is required. If a person accepts payment in exchange for calling bids at a fundraising auction (“payment” could be a meal), an individual is required to have an auctioneer’s license. The penalty for conducting the auction without a license is ~$2000 fine. It’s not any more difficult to get an auction license than it is to get a real estate license. Which is to say, it’s not hard — but it does require money and time. Virginia and Florida auctioneers must attend an approved school, pass a state-administered test, secure a bond, and keep up with continuing education requirements. In Washington, D.C., the auction laws are different. Virtually anyone can walk into the municipal building and — about $800 later — walk away with an auctioneer’s license in hand. In Maryland, licensing varies by city or county. A county license might be $0 to $300; the City of Baltimore is ~$2800. I’ll be honest: Licensing is complex, costly, and can be confusing. Here’s an example. If a non-profit is based in Maryland, but the auction is to be held at an embassy in D.C., what sort of license is needed? If they plan on holding a raffle — but only selling tickets at the auction itself (which is at the embassy), do they need a license? What if the drawing is held the next day, when they are back in their offices in Maryland? If they are on “foreign soil” (the embassy) when the activity takes place, do they need to follow D.C. or Maryland law? Whew! It’s worth a phone call or two to clarify questions with authorities. Sherry, my non-profit is thinking of changing from a “host” or open bar to a cash bar this year to improve revenues. What do we need to take into consideration? What is your opinion? Great question, Betty! I prefer open bar, but here are ideas to mull over. Consider ticket price first. A higher ticket price (“high” in your area) should include open bar. But if you’ve got a bargain basement ticket price and perhaps have a history of losing money on ticket sales, then – by all means – SOMETHING needs to change. (E.G. Either higher ticket price and keep open bar, or switch to cash bar.) Second, consider the crowd. One of my clients has a heavy religious population that will not drink alcohol. To cater to both sets — drinkers and non — they offer two levels of ticket prices. One ticket option includes open bar; the other doesn’t. Third, consider attitude. It can get a bit “nickel-and-dime-y” to have people pulling out their wallet for a drink here and there, only to then start asking them for money. They don’t want guests to start feeling broke before you even ask for the donation! A final thought: I’ve had a couple of clients review their cash bar revenue post-event only to find that the money raised was nominal, when compared with the general aggravation of running a cash bar. In both cases, they came to the conclusion they’d rather offer an open bar (which is perceived as more generous) and simply sell an additional live auction item or two and make up the difference in revenue. Thanks, Sherry! Great advice as always!! What can you tell me about the legality of having wine or beer as a silent auction item? We are also in Virginia. Lelia, that’s a great question, but not for me. I’d call the ABC. Florida does NOT require a bond. There is a Recovery Fund that negates the requirement for individual, or auction business bonding. Also, Florida does NOT have a continuing education requirement for auctioneers…at least for now.